crafty lil' thing: Tiny Lil' Weasly Sweater. 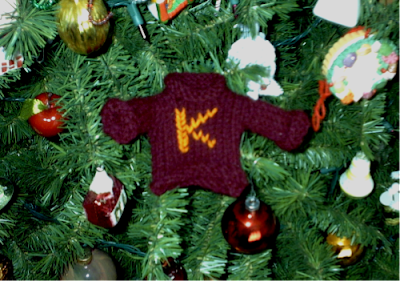 I'm taking down my Christmas tree today and I found the tiny Weasley sweater I made for K this past Christmas. 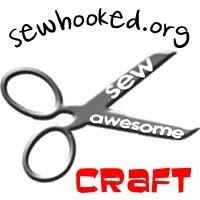 I borrowed Charmed Knits from the library and followed the pattern. It wasn't hard and turned out really well. Yes, I said my Christmas tree is coming down today, March 12Th. Oh Honey, this is nothing. (Imagine a thick southern accent.) One year we just took all the Christmas ornaments off and put on painted eggs and felt bunnies and such. It looked real nice Easter Morning. It's not that we really like Christmas or anything,.... it's just that,... well,... it's Miss. Kitty. You've seen Miss. Kitty. She loves that tree so much, we just haven't the heart to take it down. She waits all year, well the 8 or so months it isn't up, for us to put it up, and then she crawls under and stays there till the last branch comes down. Only comes out to eat and chase dust bunnies. I think at this moment y'all can imagine the dust bunnies around the Christmas tree, now can't ya'? Oh yeah. And yes, now and then we do turn the lights on in March. Looks real pretty. This year I'm taking it down a bit ahead of schedule. My friends and neighbors will be so surprised, and should stop giggling and pointing. Thanks! The pattern was accurate and easy. And K loved it. She wants to make one now. Yes!